As jaded as I am by the reports on the estimated number of particpants in public demonstrations, I am flabbergasted by this one. 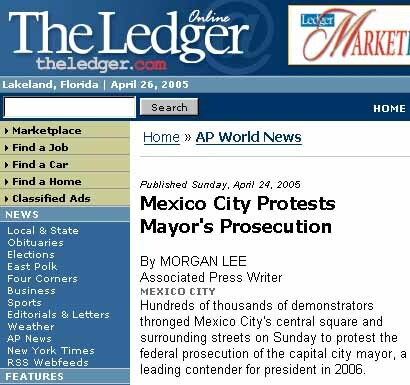 The headline read: "Thousands support Mexico City mayor." Even a cursory glance at the accompanying photo would suggest that there were more than 'thousands' since the Paseo de la Reforma is a wide 12-lane boulevard and the crowd stretches all the way down the horizon as far as the eye can see. And then I read in the first paragraph in the article: "Hundreds of thousands of demonstrators ..."
The word 'thousands' usually means several thousand, while "hundreds of thousands" means several hundred thousand. So why did MSNBC short-change the crowd size by a factor of hundreds? Could it be that they did not have enough room? Hmmm ... Do you see that big chunk of white space above? This is the sort of thing that gives the press a bad name. The same AP story appeared elsewhere with a different headline. Reuters: "The march was one of the largest in Mexican history although city and federal officials predictably clashed over that, too. City police said 1.2 million people turned out, while federal police said there were only 120,000." IHT: "The police estimated that more than a million people participated in the march Sunday. Aides to the mayor estimated that there were 750,000 people. Several political observers described the march as the biggest in the country's recent history." Christian Science Monitor: "Mexico City police, who work under López Obrador, estimated that some 1.2 million demonstrators were on the streets Sunday, ranking it among the largest protests in Mexican history." 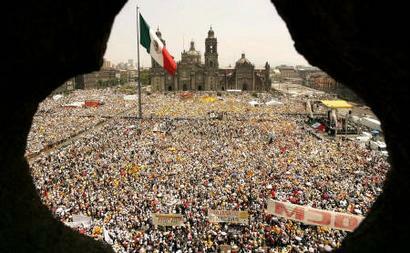 Knight-Ridder News: "More than a million people overflowed Mexico City's streets Sunday to protest the prosecution of mayor and presidential hopeful Andrés Manuel López Obrador. 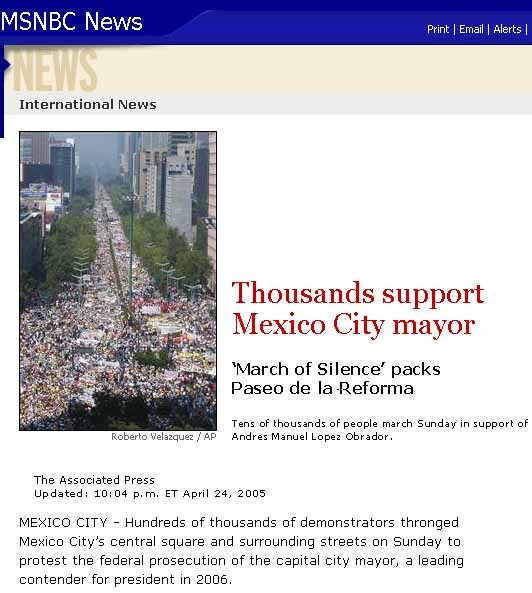 Mexico City police estimated that 1.2 million protesters joined the so-called "March of Silence," which would make the protest the largest march for democracy in Mexican history." El Universal: Andrés Manuel López Obrador, Mexico City's mayor-in-limbo, joined with an estimated 1.2 million of his supporters in a march on Sunday, at which he called on Mexicans to rally behind his "new project for the nation." This march may belong to the category known as "uncountable." None of the rigorous counting methodologies can be applied on account of the sheer size.